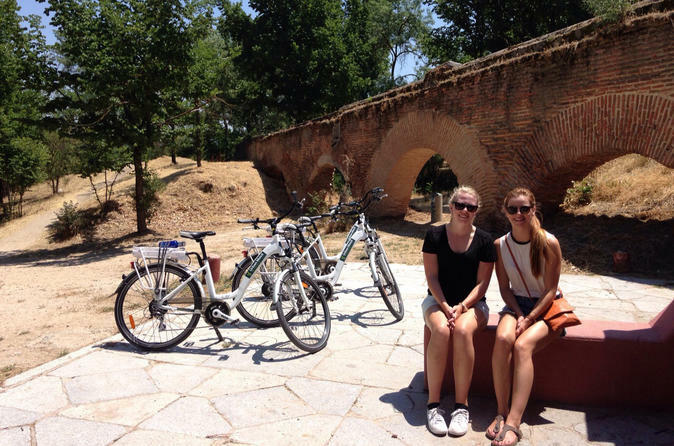 Get to know Madrid like a local on this bike tour. Madrid’s favourite local walk is along river Manzanares with its beautiful 10 year old park, from there you will enjoy beautiful views and cross to the biggest urban park in Europe, Casa del Campo, a former royal hunting area now full with locals in the weekends. Hop on to your bike and enjoy a ride that will take you to the newest part of the city. Once the innermost ring road of Madrid, the busiest road in Spain and famous for its traffic jams, it’s now a beautiful pedestrian promenade. The small lake which you will see during the tour fills with madrileños during the weekends, rowing boats, and having barbecues. If time permits and you feel like going for an extra bit of exercise, you will have the chance to climb a hill where you can take a few minutes to rest and admire the skyline of the city. Then begin the descent towards the river and get a great view of the Cathedral and the Royal Palace from the Huerta de la Partida before returning to the town center.